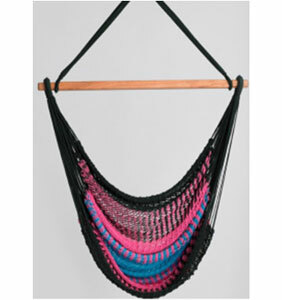 An attractive and comfortable swing bed, this sitting hammock is made of slim cotton ropes dyed in rainbow colours. Great for indoors too as it doesn’t take up much space and even allows you to stretch your legs into a sleeping position. Made from 3mm cotton ropes dyed into rainbow colours and intricately woven. Hammock comes with a ecru bag with a carry-on strap. Comes with wooden spreader bars and zinc plated rings. Can be hung from a fan hook or anchor bolt installed by an expert.